Home » Featured » POP THE CORK…POP THE QUESTION! POP THE CORK…POP THE QUESTION! What could be more romantic – a sunrise for two at Carlo Sandblow? For all you hopeless romantics out there, that very special day of the year is upon us again… February 14, Valentine’s Day. Unfortunately, it also signifies the demise of the gentle St. Valentine himself, a good mate of Claudius 11 until they had a disagreement over religion (still recommended as a subject to avoid) and Valentine literally lost his head on February 14 269AD. But for those hearts he touched with the message of love, his name and memory still live on with great fondness, 1,750 years later. The day of love has been celebrated in many ways, from a simple sweet note placed strategically, to big, fat, fabulous weddings! Somewhere in the middle is what most of us would either love to give or love to receive, perhaps both – and it’s not always about having a gift to unwrap (plenty of that occurred only a few weeks ago I’m sure), so perhaps an unforgettable experience is the way to woo. Who wouldn’t be swept off their feet by a surprise horse ride along our beautiful beach, or the chance to enjoy the delightful company of dolphins swimming right beside you, whilst taking in the sight of that incredible turquoise ocean, on a kayak? 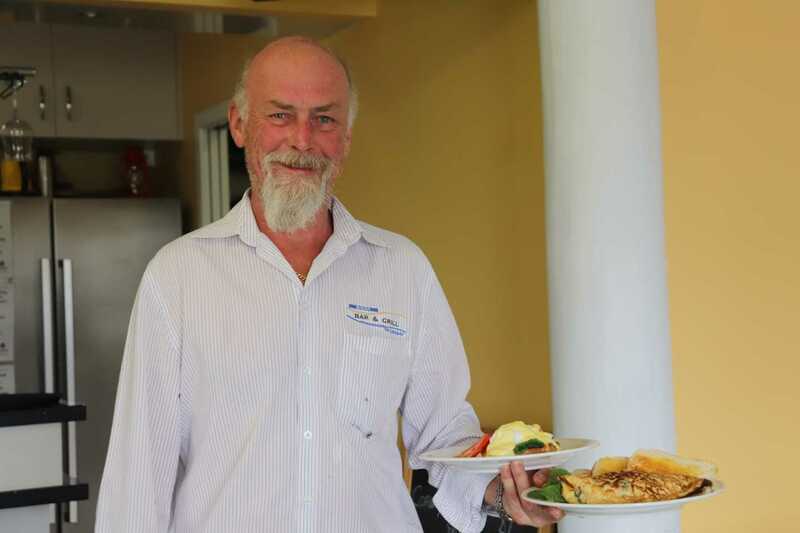 Enjoy a morning or night off cooking by visiting one of our restaurants on the Cooloola Coast. 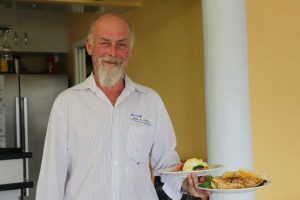 Richard from Tin Can Bay Marina Bar and Grill presents breakfast! Of course, a romantic dinner is a romantic winner, so a little taste of Italy would melt a heart, plus there are some great restaurants and clubs all across the Cooloola Coast, for the foodies to impress someone special. If you prefer to relax at home, IGA always offers a great selection of goodies to indulge your taste buds too. Why not treat yourselves to a night away at the Getaway to make for a perfect evening in? However, for those of us who have to set off for work, an opportunity to start the day in a very romantic way, is to witness a magnificent sunrise from Carlo Sandblow. Truly one of the most stunning vistas in the world! Prepare by acquiring a lovely bottle of bubbly from the Bottle-O, some warm croissants from Ed’s, grab a comfy blanket and your treasured loved one and set off for a glorious morning together. As the first rays appear over the horizon, pop the cork and perhaps…pop the question! After all, being a hopeLESS romantic could rapidly change to becoming a hopeFUL one. All it takes is a little planning which could lead to a beautiful memory and a very happy ending. Waterview Bistro re-opens its doors!